If there is an upside to not living in Atlanta, it’s that every time I visit there seems to be a bevy of new and exciting restaurants to try. One that had slipped past my radar was the newest restaurant from Chef Ford Fry of JCT Kitchen. Headed by a former sous chef of JCT Kitchen, Chef Adam Evans, The Optimist is the newest casual seafood restaurant on Atlanta’s Westside, but that’s enough background, it was time for lunch and Jennifer and I were looking for some quality seafood. 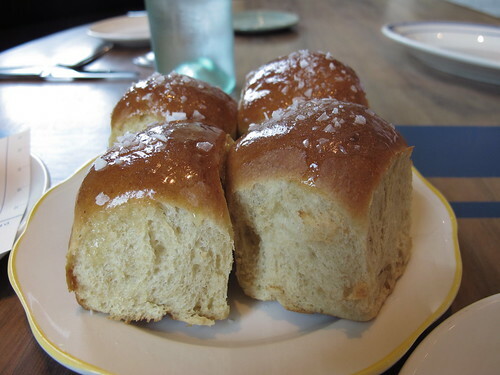 Although we had come to The Optimist in search of oysters, shrimp, clams, and the like, we couldn’t help starting with an order of the Opti yeast rolls. 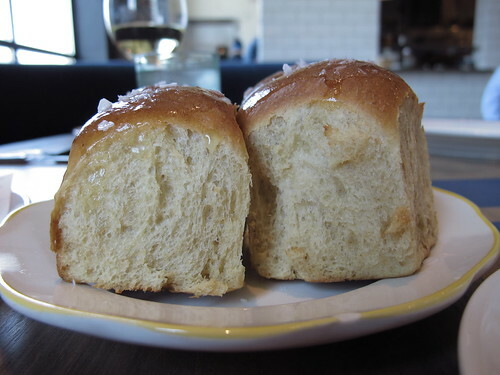 It’s amazing the flavor that can develop with time and yeast, and these rolls were no exception. Practically glowing in the light, I could very well have made an entire meal from these rolls. 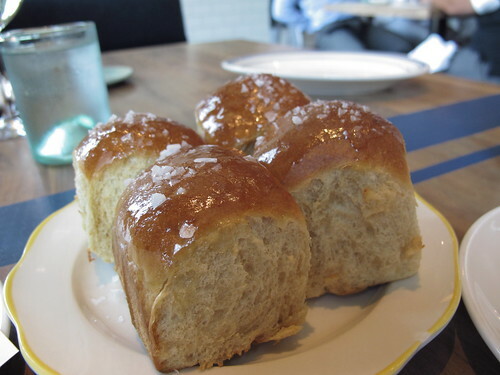 With a sweetness and complexity from the yeast and the punctuation crunch of sea salt, this order of four rolls quickly disappeared. 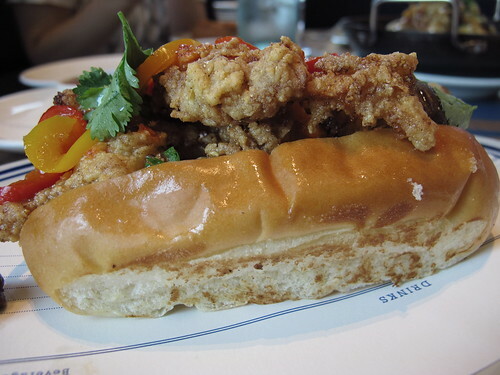 I had planned to start into the seafood with a half dozen oysters, but with neither Kumamoto nor Apalachicola oysters on the menu I was quickly lured by the promise of kimchee in the fried clam roll. 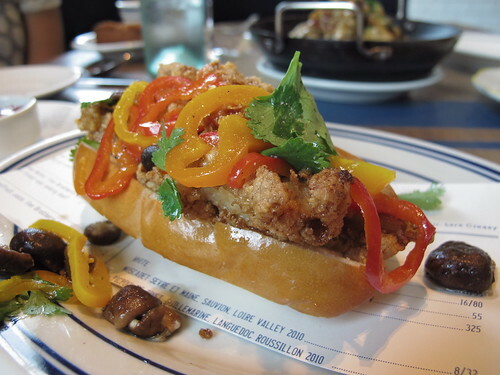 The heavily buttered New England cut roll was quite literally overflowing with well fried clams and house pickles. On their own, the clams and roll may have been far too rich, but each bite was tempered with rice vinegar, kimchee, and cilantro pungency. Even though this roll was a bit cumbersome to eat, the combination of salty, crisp clams and Korean flavors made me reluctant to share. 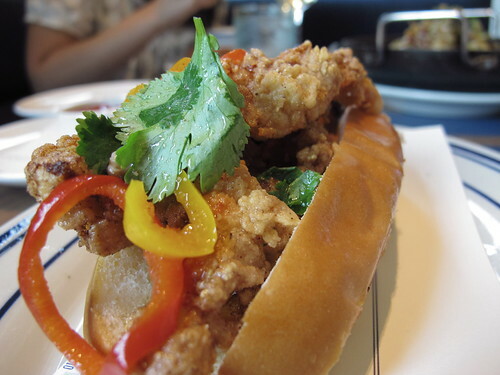 Described on the menu as “messy, but worth it!”, the white Georgia shrimp a la plancha gave the fried clam roll some stiff competition. 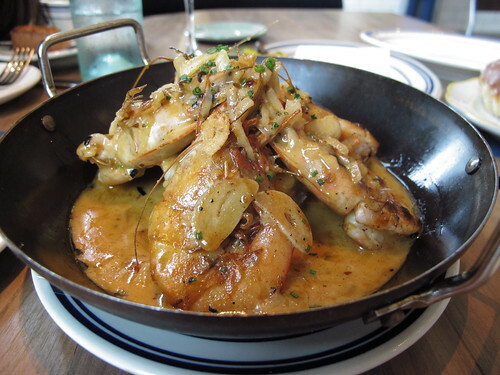 True to its description, these shrimp a la plancha were incredibly messy but just as incredibly worthwhile. 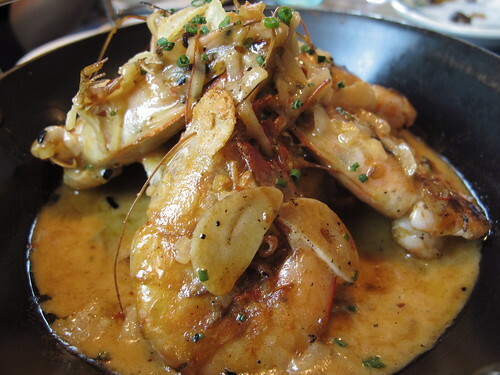 Each shrimp was well charred on the outside and brimming with a rich briny flavor that was only highlighted by the arbol and garlic richness of the sauce. Nearly bisque like in creaminess and texture, every last piece of bread was used to take full advantage of the sauce. While we had been flying high with the clam roll and shrimp, it was an unlikely candidate that would bring us back to earth. 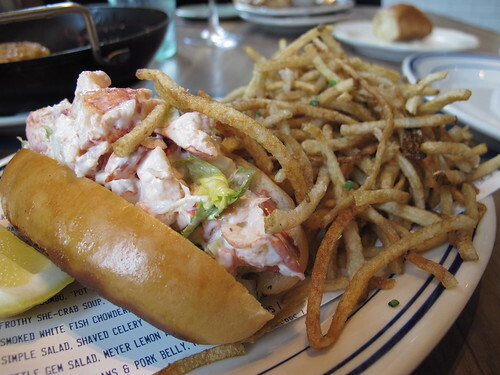 The Maine lobster roll, for all intents and purposes, should have been a star attraction, but a few things were amiss. 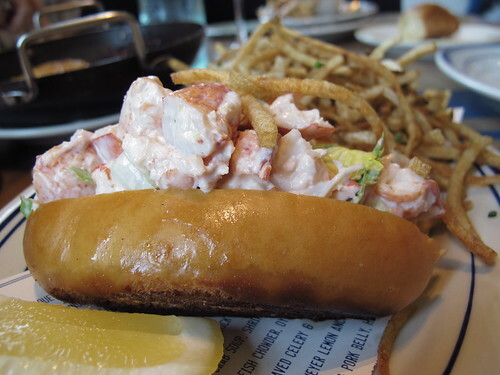 Size wise there was ample supply of large lobster pieces, but it was the texture that kept this lobster roll down. Even with the mayo as a buffer, there was an overcooked chalkiness to each piece of claw meat. Luckily the tail meat didn’t suffer the same fate as its sweeter texture played well with the satisfying vegetal crunch of the celery cubes. We had come to The Optimist hoping for well-cooked seafood in a welcoming and casual atmosphere and we found it in spades. 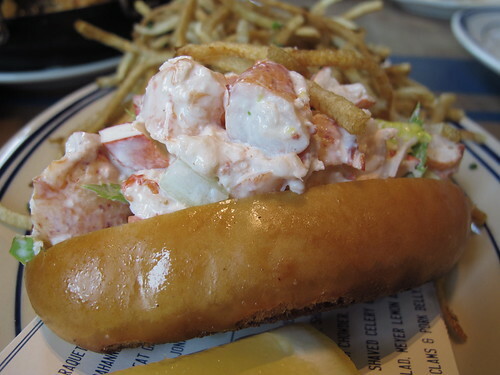 In fact, the only low point of the meal, the lobster roll, was a bit misleading. Anywhere else, this roll would have been a fine menu choice, but in comparison to the clam roll and shrimp a la plancha, it was mediocre at best. Even with that stumble, Chef Fry and Evans had delivered; I can only hope that next time we come to feast on seafood from The Optimist they’ll have some smaller and brinier oysters at the raw bar.